I hate that everything is all draped with watches and ties and shiz, but I guess you gotta push the product. It is pretty amazing to see these all IRLlike, I think I almost got in the Christmas spirit! I still want to see this movie! The windows look awesome. I was SO OBSESSED with that book when I was little, and I LOVED the movie! Before reading the book I listened to it on tape in the car. So one day I asked my mom how to use our home sound system and she was like, "You're not listening to Fantastic Mr. Fox again, are you?" and I lied and said No, Harry Potter. I seriously adored that book! 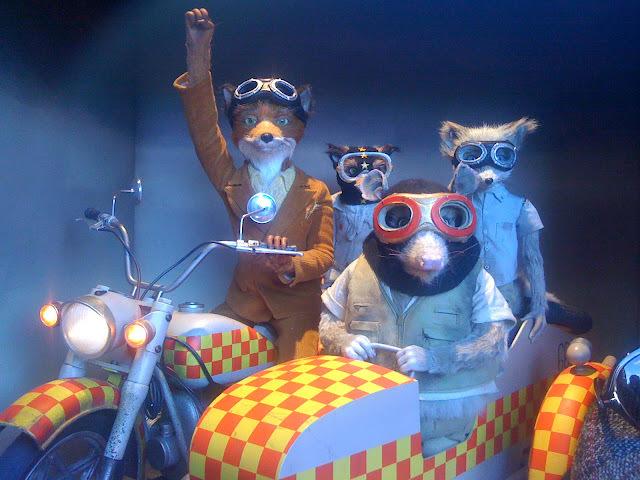 the fantastic mr. fox is the best cussing movie of all time. My brother and I have agreed repeatedly that we need to see this movie but haven't found the time. It sounds amazing though. Weren't the Foxeses at Luella Christmas Grotto too? When I told my mom how much I loved this movie she was like, "I just didn't get it." When I asked what she meant she said, "What part of 'I don't get it' didn't you understand."